Star Wars first came to the big screen in May, 1977 and was instantly a phenomenon. The stunning visuals, thrilling soundtrack, and otherworldly things like blasters, lightsabers, the Force and Death Star are all major parts of the public's fascination with Star Wars. Perhaps the underlying themes of the story are the real reason most people are drawn to the tale of Luke Skywalker and his friends. A space saga seems an unlikely story to captivate the world, but at its essence, Star Wars is nothing more than a story of humanity involving things we all experience like sacrifice, trials, betrayal, loss, heroic moments and triumphs. If you asked most people what they thought of when they heard the word, mythology, most would mention Hercules, Prometheus, Zeus, or simply the Ancient Greeks. It is rare to think of anything else associated with mythology. Myths traditionally tell the story of a hero who is presented with a great quest and must overcome tremendous obstacles to fulfill his destiny. Sound familiar? If it does, it is because Star Wars is a modern myth. In the original trilogy, Luke Skywalker is our unexpected hero who ends up destroying the tyrannical rule of the Galactic Empire, but at great personal cost. Using Star Wars, we hope to help you and your students better understand the common themes and magic of mythology. Star Wars has captured the hearts and imaginations of millions and millions of people like no other story of our time. This official companion volume to the landmark exhibit at the Smithsonian Institution's National Air and Space Museum explores the mythological roots of the Star Wars saga, a story that will continue to unfold into the next millenium. Written by the exhibit's curator and illustrated with hundreds of photographs, drawings and images, Star Wars: The Magic of Myth illuminates this modern tale of the ageless and mythic battle of good versus evil. The descriptions that follow were inspired by and adapted from the Smithsonian National Air & Space Museum's Exhibition- Star Wars: The Magic of Myth. The first part of any mythic tale introduces us to our hero, his background and ultimately the difficult task he must complete. Along the way he finds his hero partners or helpers and acquires the "tools" that will eventually help him accomplish his mission... something always easier said than done. 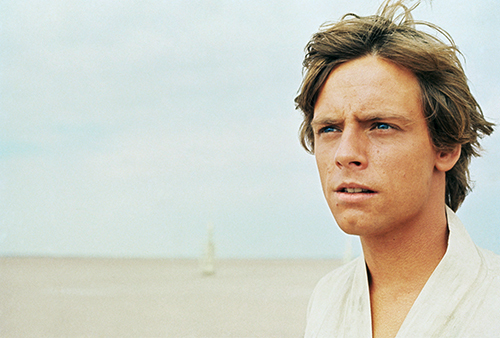 The adventure of Luke Skywalker follows the classic stages of a hero’s journey. A farm boy from the backwater planet of Tatooine, Luke is pulled from obscurity into a world of adventure when two unusual droids appear in his life carrying a hidden message from a mysterious princess. With the aid of a wise guide, Obi-Wan Kenobi, Luke gains a mystical knowledge of the Force, enlists rugged new companions, Han Solo and Chewbacca, and crosses the galaxy to rescue the princess. In mythology, the hero’s journey begins with a call to adventure, the first incident on a dangerous path that will separate him from his home and family. The call usually comes in the form of a herald, who carries a message that causes the adventure to begin. Often the hero does not recognize the hand of fate at work, and an event which may seem ordinary in fact a turning point that catapults the hero into a world of danger and excitement. As the Star Wars story begins, a battle in space rages high above the planet of Tatooine with the evil powers of darkness (the Galactic Empire) relentlessly pursuing the forces of good (the Rebel Alliance). Princess Leia sends a plea for help to the planet below. The hand of Fate, in the form of Jawa traders, brings her message to the restless farmboy, Luke Skywalker. Luke dreams of becoming a space pilot, but is torn between his desire to enroll in the Academy and his loyalty to his family, who need him on the farm and fear that he will never return if he leaves. Luke’s life is transformed when his uncle buys the droids C-3PO and R2-D2, who carries the Princess’ plea for help, from passing Jawas. Their arrival heralds the beginning of the quest that enables Luke to discover his true birthright and destiny. When he sees thte message hologram contained within R2, he is drawn into a quest to rescue the Princess and ultimately save the galaxy. As the hero sets out on the path of adventure, his journey will not just be a physical one, but more importantly, a spiritual one. The world of the spirit is always protected by guardians of some sort The Nio protect Buddhist temples, an angel guards the Garden of Eden, Cerberus stands watch over Hades, the Scorpion-men guard the mountain tunnel which leads to Dilmun, and the dragon Smaug protects the treasure of Misty Mountain. For Luke, his path from the temporal world to the spiritual is initially blocked the Tusken Raiders. However, it can be argued that Uncle Owen is also a guardian, trying to prevent Luke from beginning his quest, knowing of the path which Luke could take; the same path taken by his father, one which leads to the Dark Side of the Force. Before setting out, the hero must first encounter “threshold guardians,” beings who block the way to adventure. Luke faces such guardians when he is attacked by the Tusken Raiders. However, he is rescued by Obi-Wan Kenobi. Often, the inexperienced hero finds that he cannot proceed without supernatural aid in the form of a wise guide who provides assistance. The hero may be unaware of his destiny, but even when he discovers it, he may try to refuse his difficult quest until the guide shows him the way. Master Obi-Wan fulfills this role for Luke, giving him advice, Jedi training, and the mystical knowledge of the Force that he will need on his adventure. The path ahead will contain many obstacles to test the hero’s skills and courage, but with Obi-Wan’s help, Luke takes on the challenge. During his quest, the hero is often provided with insight from some mystical, otherworldly source. In the Greek myths, this insight is often provided by the gods. In George Lucas’ universe, it is provided by the Force, “an energy field created by all living things, which surrounds us and penetrates us and binds the galaxy together,” as Ben explains to Luke. In mythology, the wise guide often gives the hero an object with magical powers to guard and assist him on his chosen path. The idea of a magical sword, such as the lightsaber, appears many times in legend: it is a powerful symbol that gives its owner the right to challenge authority. In this case, Obi-Wan gives Luke his father’s lightsaber. By accepting the lightsaber, Luke continues his father’s Jedi heritage. The weapon is a powerful talisman, which inspires him to take the first steps on his path toward becoming a Jedi Knight. Heroes often are reluctant to answer the call to adventure. For instance, Daphne refuses the love of Apollo and for that is turned into a willow tree. Bilbo does not want to accompany the dwarves to Misty Mountain. Enkidu is reluctant to follow Gilgamesh to the sacred forest. Like these other reluctant heroes, Luke initially refuses Ben’s call to adventure. However, the death of Uncle Owen and Aunt Beru set Luke on a course for which there is no turning back. Heroes often have a straightforward goal, yet they are usually sidetracked along the way and will wander for years. Odysseus is a prime example and even the life of Moses will fit this pattern. Luke will be headed for Alderaan when his life suddenly will be changed forever. His goal is to become a Jedi, yet after the events of Star Wars, he will wander far and wide as he slowly makes progress towards obtaining this goal. To make the journey, the hero needs a vehicle and often, they employ a ship and mates. This applies to both Odysseus and Luke, whose vessel, at first, will be the Millennium Falcon. The hero will then become quite close to his companions who are now partners in his adventure. Thus enters Han Solo and his first mate, Chewbacca. The hero must leave his familiar life behind to begin a journey from childhood to adulthood and to a life transformation. The sleazy Mos Eisley spaceport is Luke’s threshold to adventure. Here he encounters danger but he also finds hero partners in the pirate/smuggler Han Solo, captain of the Millennium Falcon, and his faithful first mate, the enormous Wookie, Chewbacca. Solo and Chewbacca will serve as courageous and valuable allies as Luke proceeds on his journey. Once leaving Tatooine, the band of heroes heads to Alderaan, home planet of Princess Leia. In most of the best loved fairy tales, there is always a damsel in distress and Star Wars is no different. There is a princess who needs rescuing, but Leia is no passive damsel in distress. During the course of the story, she will follow her own path toward becoming a heroine. In many myths there is a traditional character triangle: hero-monster-woman. In the case of Star Wars the monster or, using the medieval form of monster, the dragon, is the Death Star. To save the princess, from the dragon, the heroes act as medieval knights, donning armor (stolen from the stormtroopers) as they set of to rescue Leia. As the hero matures, there comes a point in time when he must let go of his guide and strike out on his own. Just as Arthur had to lose Merlin, so, too, does Luke have to lose Ben in order that he may grow. Despite his death, however, Ben will remain with Luke to help him from time to time, only now he provides more mystical insight. After accomplishing great feats, our hero is riding high despite his ultimate task remaining before him. As he trudges ahead with great confidence, our hero will be swiftly reminded that difficult roads lie ahead and final victory remains elusive. Midway through the hero’s journey comes a long and perilous path of trials, tests, and ordeals that bring important moments of illumination and understanding. Again and again along the way, monsters must be slain and barriers passed. Ultimately the hero must undertake the fearful journey of the descent into darkness. Although the Death Star has been destroyed, the power of darkness have not been conquered. The Empire has pursued the Rebels to the ice planet of Hoth, where the heroes face new dangers from frightful monsters and the harsh climate and are forced to flee during an Imperial attack. In mythology, hunting or being hunted is a common element of a hero's journey. In The Empire Strikes Back, we quickly learn that Darth Vader has been hunting and pursuing Luke Skywalker and the Rebel forces across the galaxy. Although they are eventually found and forced to evacuate Hoth, the hunt continues. Luke has travelled to Dagobah where he is hunting for Yoda, a powerful Jedi Master who will continue his training in the Force. Simultaneously, Darth Vader and his Imperial Forces continue hunting Luke Skywalker and his friends. Vader employs deadly bounty hunters like Boba Fett to aid in the search for the Millenium Falcon. Whether hunting or being hunted, the hero will emerge stronger, wiser and more capable. One particular mythic motif is the “swallowing up” of the hero by a large monster. This represents the entry into a mystical world where transformations occur, and the eventual escape represents a spiritual rebirth. Han and Leia are pursued by Imperial Star Destroyers and TIE fighters as they leave Hoth. To escape, Han flies the Millennium Falcon into an asteroid “cave,” which turns out to be the mouth of a huge space slug. Han and Leia are changed while here, at last opening their hearts to love. Vader also undergoes a change at this point, when he emerges from an egg-like mediation chamber. The Emperor appears to him through a holographic message, and Vader is revealed as a slave to the evil forces of the Empire, rather than as their master. In mythology, one of the trials of the hero is to leave the world behind and go alone into a forest full of danger. This “sacred grove” represents a place where the hero is changed. To ancient peoples, forests came to symbolize mystery and transformation and they were the home to sorcerers and enchanters. When Luke leaves Hoth, he travels to the planet Dagobah to undergo training with the Jedi Master, Yoda. The hallmark of Dagobah is its large, oddly shaped trees. Forests can also symbolize the unconscious mind, where there are secrets to discover and perhaps dark emotions or memories to be faced. In this forest, Luke battles an image of Vader, which turns out to really be himself. An important stage of the hero’s journey is a mystical relationship with a woman. First, though, the hero must prove himself worthy of her. After meeting Princess Leia, Han Solo begins his own hero journey, and is gradually transformed from a selfish individual to a compassionate fighter for the Rebellion. Luke’s hero quest is a spiritual one instead of romantic one. During the hero’s journey, he or she is often required to make some sort of sacrifice in order to achieve some greater goal or attain some sort of insight. More often than not, this sacrifice is very painful, either in a physical, mental or spiritual sense and is often accompanied by betrayal. For Luke, many sacrifices are made at this point in his journey. He sacrifices his training, he sacrifices his hand, and he sacrifices his innocence. It is perhaps the loss of his innocence, which is the most significant of these three. No longer will he be the naive boy who only dreams of being a Jedi. On Han’s journey, there is betrayal and the discovery that Leia loves him. But before he can return her love, he must endure a kind of “death” as he is frozen in carbonite then taken away by the bounty hunter Boba Fett to be delivered to the vile gangster, Jabba the Hutt. Han’s friend, Lando Calrissian, who betrayed Han to Vader, will undergo a life change and begin his own hero journey. The danger of illusion is symbolized by Cloud City , a place of grand beauty floating high above the planet Bespin. What appears to be beautiful, however, has a dark underside that becomes a place of pain and betrayal for the heroes. It is here, beneath Cloud City that Luke confronts Vader. During the battle, Luke loses his hand. His father asks Luke to join him or die. Realizing that his father represents everything that he despises, Luke would prefer to die than become a force for evil. Rather than yield to his father’s will, the hero chooses to sacrifice his life and leaps into the abyss. After travelling the difficult Dark Road of Trials, the hero has been humbled and given the final skills needed for his journey. Many challenges remain for our hero, but he is at last ready to fulfill his destiny and complete his epic quest. The hero is ready to return home when he has proven his worth through brave action and dangerous trials. Luke has rescued the princess, destroyed the Death Star, and learned the ways of the Force. In mythology, the hero must now use his knowledge to help his people. Returning home to Tatooine, Luke’s first act is to rescue Han from Jabba the Hutt. This is not an easy transition for him; his new-found abilities as a Jedi Knight are doubted by friend and foe alike. As the story continues, all the characters undergo changes: Han is resurrected from his carbonite tomb, Lando makes up for his betrayal of Han by helping to rescue him, and Leia assures the end of Jabba’s reign of tyranny by destroying him. Mythic stories are rife with the images of heroes fighting monsters. And these monsters do not have to be actual creatures but anything in life that we perceive to be a threat. Once more, if the hero does battle with this monster and survives, he will gain more power. Examples from classic tales include Theseus and the Minotaur, Bilbo and Smaug, and Gilgamesh and Humbaba. In Return of the Jedi, Luke must prove his strength as a Jedi by defeating the Rancor without a weapon. His success in this battle reveals just how powerful he has become. The heroes are not the only ones who can undergo change and rebirth. The forces of evil can also recover their power and grow with new strength. While the Rebels continue to struggle against Imperial Tyranny, the Empire is constructing a new Death Star. A final confrontation must now take place. The forces of good, represented by Mon Mothma, leader of the Rebel Allicance, and those of evil, led by the Emperor, regroup to plan their strategies. Luke discovers that Leia, who has guided and supported him throughout his journey, is his twin sister. He also finds that he must confront Vader again. Yet when they make mind-to-mind contact through the Force, Vader appears uncertain rather than aggressive—a sign that he is beginning a transformation. The inhabitants of an “enchanted forest” can be both dangerous and helpful. The hero must discover how to evoke their protective powers. Luke wins the help of the Ewoks, the small furry inhabitants of the forest moon of Endor. The Ewoks prove that heroes can come in any size or shape. They battle the high technology of the Empire with logs, stones, and vines. Their lush green environment and harmony with nature make a warm contrast to the cold, bleak technology of the Empire. The Ewoks help the Rebels deactivate the Death Star’s energy shield generator, so Lando can fly into the Death Star and destroy the reactor core. Meanwhile, Luke realizes that he must set out on a different path from his friends to attempt to reach that part of Vader that is still his father and to turn him back from the dark side. The heroes must at last enter the “heart of darkness,” the fortress of evil itself, to destroy its stronghold. When Han and Leia finally destroy the energy shield generator, Lando and Wedge fly into the Death Star to fire on the reactor core at the center of the space station. While conflict rages around the Death Star, Luke struggles with the dark forces within the Death Star, where he is undergoing a spiritual conflict in his battle of wills with the Emperor. The destruction of evil is not always accomplished by sheer physical force or cunning. There is always a hope that those who have given themselves to the forces of darkness can be redeemed. In his confrontation with Vader and the Emperor, Luke wins not through his warrior skills, but through an appeal to his father’s heart. When Luke refuses to kill his father at the Emperor’s bidding, the Emperor is enraged and turns on him. Helpless, Luke appeals to his father for help. This is Darth Vader’s moment to find the good in himself. He redeems himself by saving Luke and destroying the Emperor, but it is at the cost of his own life. Masks are frequently part of mythic ritual and Darth Vader’s mask is part of his evil persona. When he asks Luke to remove his mask it represents Vader’s release from the dark side of the Force and a return to his true self, Anakin Skywalker. Luke no longer fears his father and can now see him as a person. In his last moments before dying, Anakin gazes lovingly at Luke with his own eyes, not those of his mask. He has returned to the good and shows that, in the end, he has a heart that can be opened by love for his son. Luke now feels at one with his father. As the Rebels and Ewoks celebrate their victory over the Empire, Luke burns his father’s armor on a funeral pyre. The spirit of Luke’s father, Anakin Skywalker, joins the spirits of Ben and Yoda. Luke has achieved the final triumph of the mythic hero’s journey—he has brought back from his adventures the means for saving his people. Humanity has triumphed over a repressive system and Luke, through his hero’s journey, has opened his heart to compassion and succeeded in following a spiritual path between light and dark, good and evil. Disclaimer: All resources (including books and websites) provided on StarWarsintheclassroom.com are intended to be used by educators. StarWarsintheclassroom.com is not responsible for the content on linked websites. Educators are strongly advised to review any resources prior to allowing or recommending student use. Below are current event articles that relate to mythology. The Star Wars universe is populated with a variety of interesting characters and species, many of whom are considered to be renowned warriors. Several stand out from the rest of the galaxy, including the Wookiees, Trandoshans, Tusken Raiders, and the humans of Mandalore. Each has a rugged reputation, but their ferocity in combat is tempered by the cultural imperatives present in the ancestors of their people. With scary movies on my mind lately, I’ve been thinking a lot about one of my favorite scary movies, James Cameron’s Aliens, from 1986. It’s the action-movie sequel to Ridley Scott’s utterly brilliant Alien from 1979, and tells the tale of Ellen Ripley and a squad of Colonial Marines as they investigate LV-426 and the alien threat there. Like this? Be sure to check out the Heroine's Journey of Rey!